In some discussions and writing, you have referred to programs as academic. It seems like you refer to academic as a negative thing, why? When would you have children in a more academic setting? Our Neighborhood believes children learn through play. We are social constructivists who believe children learn best in the context of secure social relationships and children construct knowledge through play. Knowledge is constructed by the child through their play, engagement, and exploration. We believe children (and all people) learn best when they are engaged in projects that are they are interested in. Children in their early years and beyond can benefit from a teacher that takes on the role of coaching and facilitating children’s learning. When we use the term academic program or academic curriculum we are describing a program that is primarily focused on teaching children specific pieces of information they believe will help them prepare for school. Early childhood programs focused on academic learning such as numbers, colors, shapes, and letters often take a very narrow focus. Teachers in an academically focused program typically believe it is their role to give knowledge to children. Research doesn’t support academically focused early childhood programs. The push for early learning of letters and numbers is not based in solid research. We believe, and some research is showing, programs focused on academics turn children off of learning. Research shows children that ‘don’t like’ a subject do worse than those who like it. Early childhood is not the time to force academic learning and turn off children’s curiosity. Things parents associate with characteristics of quality such as craft projects, letter charts on the wall, and instruction in colors and numbers are not markers of quality. Read more from NAEYC. A narrow academic focus does not harness the real thinking abilities of young children, often pushing them away from their natural curiosity and desire to learn. Additionally the narrow focus of an academic curriculum is a barrier to deep learning. In this narrow focus on letters and numbers teachers can easily miss children complex thinking and problem solving because it’s not on their checklist. Sadly when children’s days are primarily filled with direct instruction they lose some of their natural curiosity. Traditional academic curriculum is based in the belief that learning comes from other people telling you information and you remembering. We don’t ever want that environment for children. Read more research. We want children to be lifelong learners. 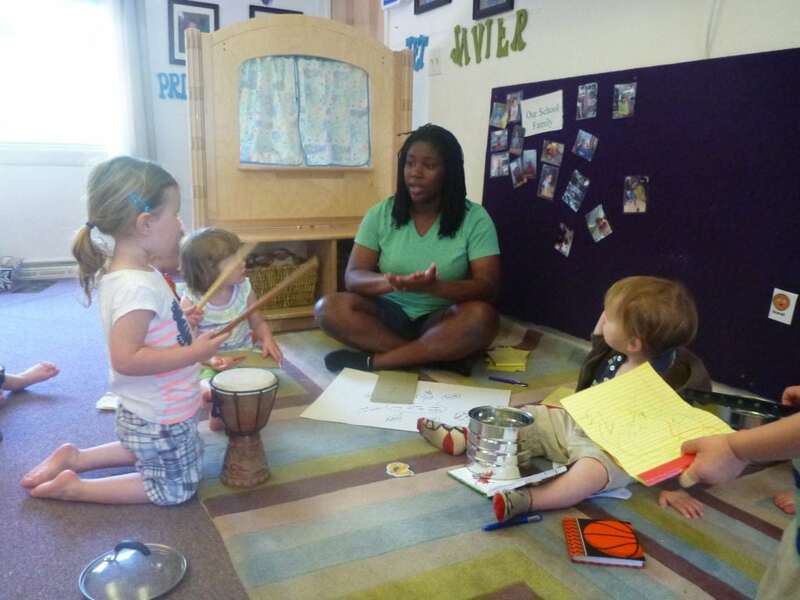 Our Neighborhood believes that learning how to learn is the most important learning in the early years. We want children to be driven towards continued learning and discovery. We believe learning comes through interest, exposure to new things, research, practice, and collaboration with others. Teachers play a vital role in this play-based learning. The teacher’s role is not to impart knowledge but to stretch children’s thinking and connect their ideas. We cannot possibly give children everything they need to learn to succeed in their lives. Our world is changing rapidly, the world that our children will live, work, and raise their family in will likely look dramatically different than our world today. We prepare children for this new yet to be created world happens by helping them learn how to learn. Children who have the skills to problem solve, investigate, collaborate, and research will be able to succeed in the new world.